Mount Pleasant Granary - Comments - Friday 2nd. January, 2015 – The rain has stopped! We woke and were pleased to see that the weather had changed and that it was fair (if not bright). Even the canal road had lost its flooding and was now back to normal – still pock-marked and ‘rural’ but largely dry. We got up extremely leisurely – had the dogs not had to be taken out it might have been even more leisurely – and took the dogs for a walk. Mix and I made our way to Salterforth along the tow path. It was a pleasant walk. I had expected to meet Rachel and Rowan on the way back but it turned out that they had walked in the opposite direction towards the centre of Barnoldswick. Back on board we had a late breakfast/early lunch. I had a roll, Rachel’s repast included Christmas chocolate. We decided to drive into Skipton but discovered that Skipton was literally full. We could find no parking place in any of the car parks nor were there any on-road spaces available. It seems that most folk are on holiday until Monday and so were brought out today to shop – I hadn’t realised that New Year was such a big holiday down here. 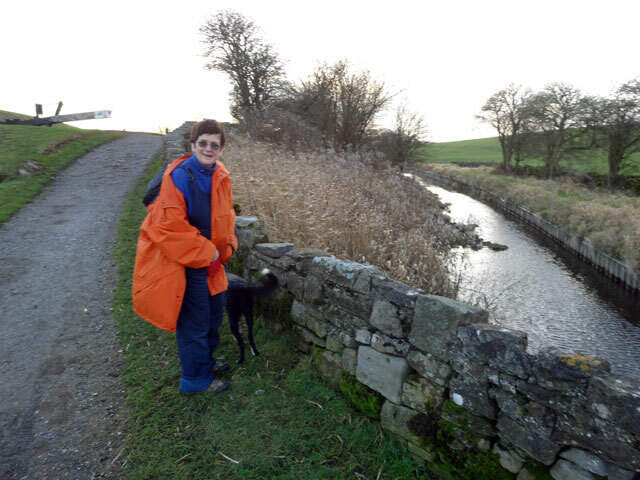 We went off to Tesco to buy what we needed and then made our way to Greenberfield where we walked the dogs along the side of the canal. The locks at Greenberfield were the first ones we navigated with the Young Rachel and so we have happy memories of them. The rain held off but it remained exceedingly cold. Back on the boat we prepared for an evening on board. Inside it was beautifully warm but we set off for a final walk of the dogs so that they would be settled for the evening. I walked this time along the route taken by Rachel this morning – into Barnoldswick but only as far as the factory by the side of the canal which manufactures mattresses. We need a new mattress and it would be rather fun to pull up at the canal-side and take one on board (but how then would be get it home)? In the evening, after a fine meal, we watched a film-remake of The Sweeney – my was it violent – but we enjoyed it none-the-less. We walked the dogs for a final time and then settled down in bed with our books. Mine – I got it at Christmas – is called Moriarty and is by Anthony Horowitz. I suppose it is a tribute to Conan Doyle; whatever it is, I am enjoying it enormously. 2015 is proving to be a very good year.